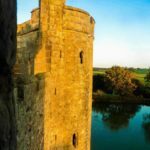 Did you know that there was a smaller twin of the famous Mont Saint-Michel in Normandy in France on the English side of the Channel? Similar in shape to Mont Saint-Michel, St. Michael’s Mount is a rocky island topped with a castle. 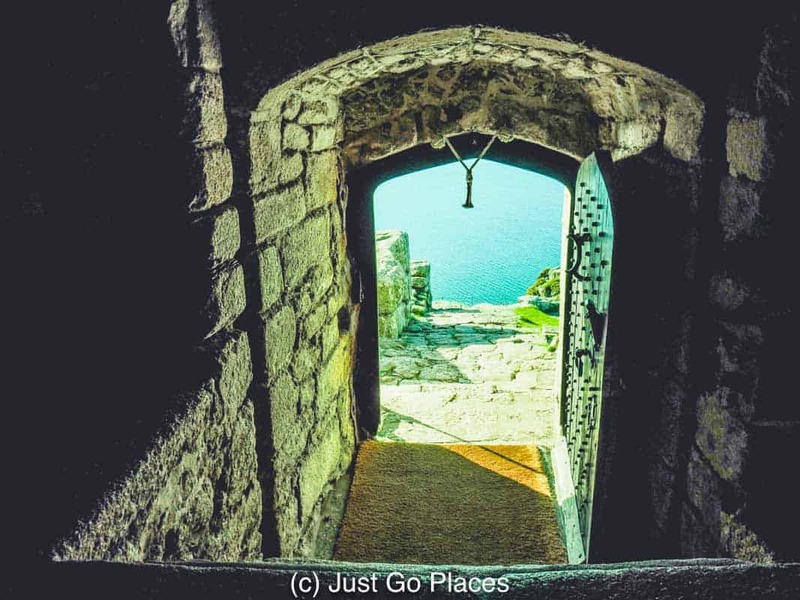 St. Michael’s Mount is one of the most famous sites in Cornwall, the southernmost county of England that juts westward into the Atlantic ocean. 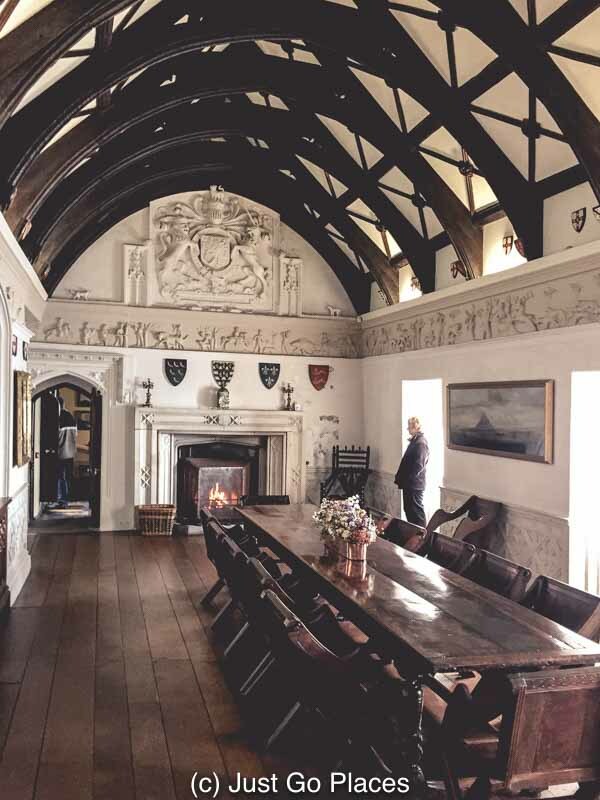 Although the family still have living quarters at the castle, the mount is now operated by the National Trust. 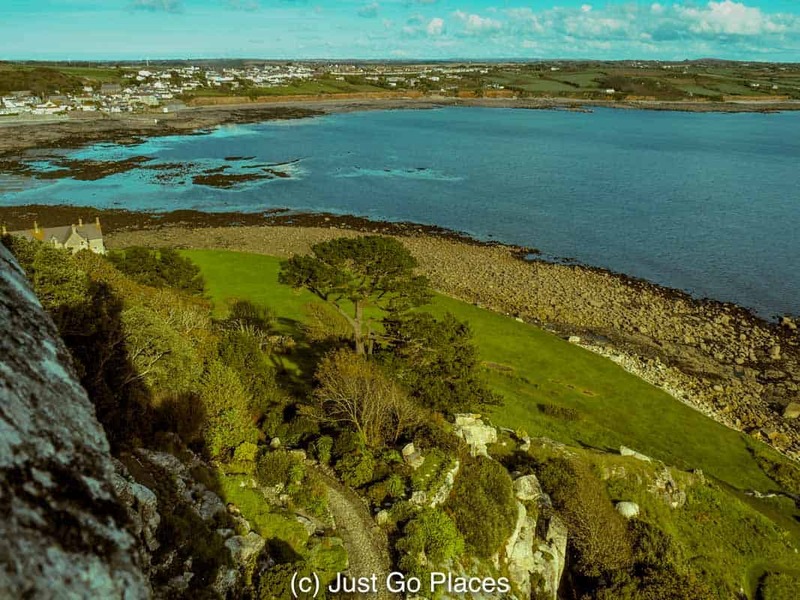 You can reach St. Michael’s Mount by walking along a granite sett causeway. 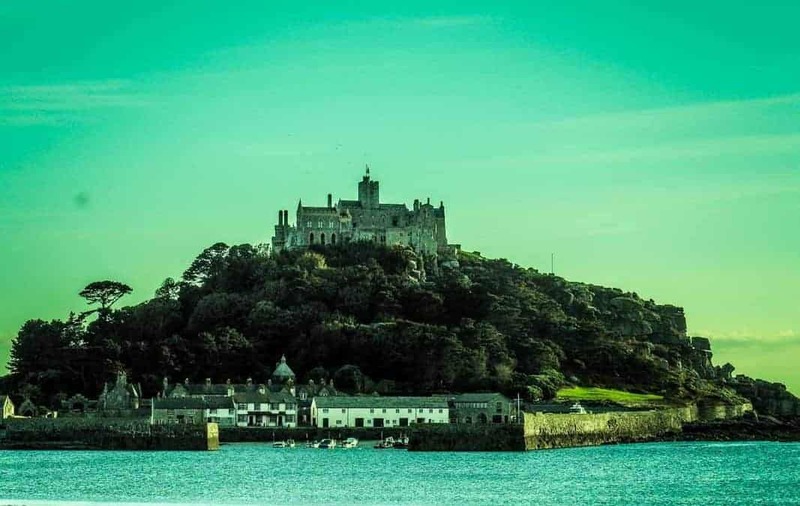 Edward the Confessor, King of England from 1044 to 1066, gave St. Michael’s Mount to the Benedictine monks of Mont Saint-Michel in Normandy in the 11th century. St. Michael’s Mount was under the control of Mont Saint-Michel until another English king took it back during the Hundred Years War with France. When the tide comes in, the little island is completely isolated by the sea. 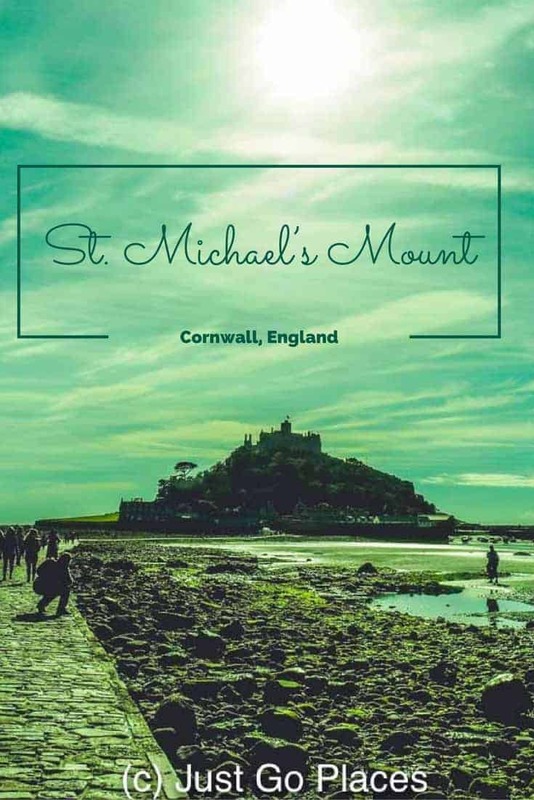 Even though the St. Aubyn family have lived on the island since the 17th century, the story of St. Michael’s Mount predates them. The oldest part of the castle dates to the 12th century. Cannons protecting this vital little island in the English channel. My son was fascinated to learn that St. Michael’s Mount was swept by a tsunami in 1755. It was caused by an earthquake in Portugal 1000 miles away! The St. Aubyn family still live in the castle on a lease back from the National Trust which maintains the property. The co-manage taking care of the historic rooms open to the public. As you would expect, the inside of the castle has lots of dark wood and traditional decor. The views from the windows are fantastic. Here’s the front door to the Castle. Yes, it’s that steep. 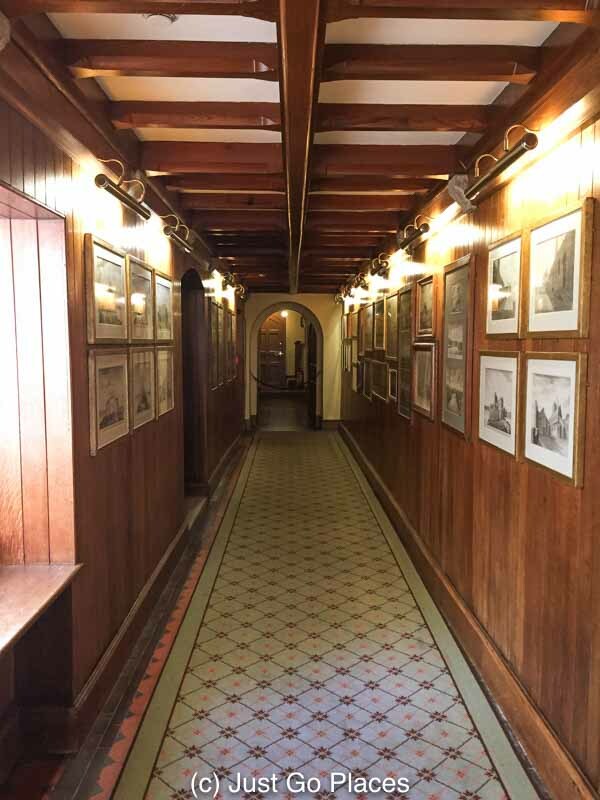 Corridors lined with family photos. The cosy reading nook is just fabulous. The grand dining room. I can’t imagine that little fire would keep this room warm when the wind whips off the Atlantic. 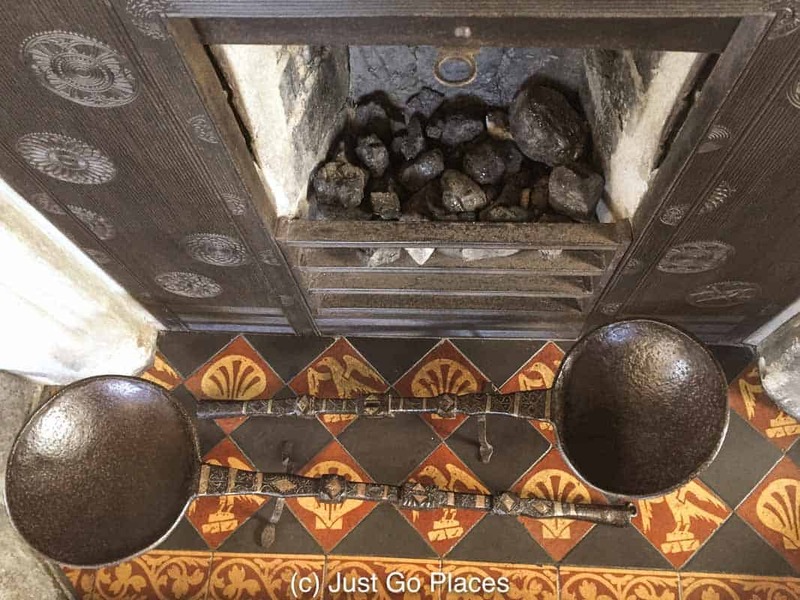 I love the detail of this fireplace hearth. 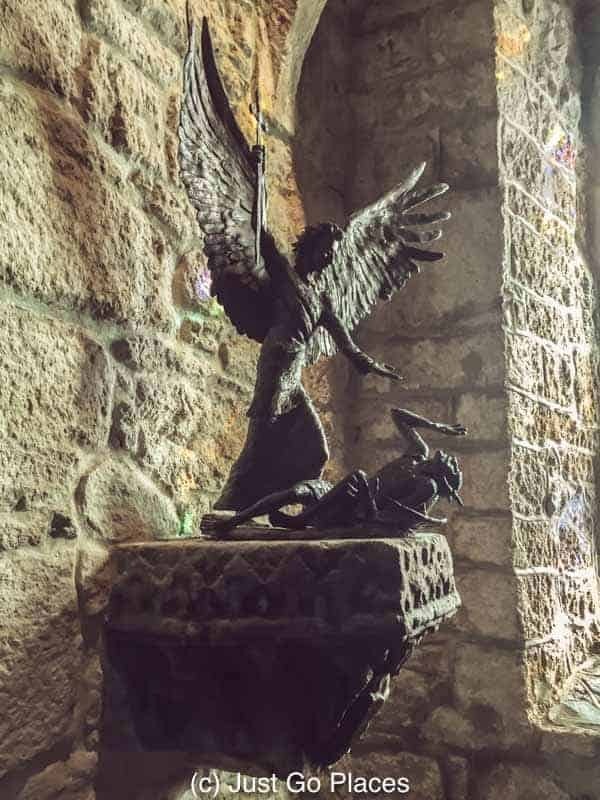 A statue of the Archangel Michael to whom the mount is dedicated. 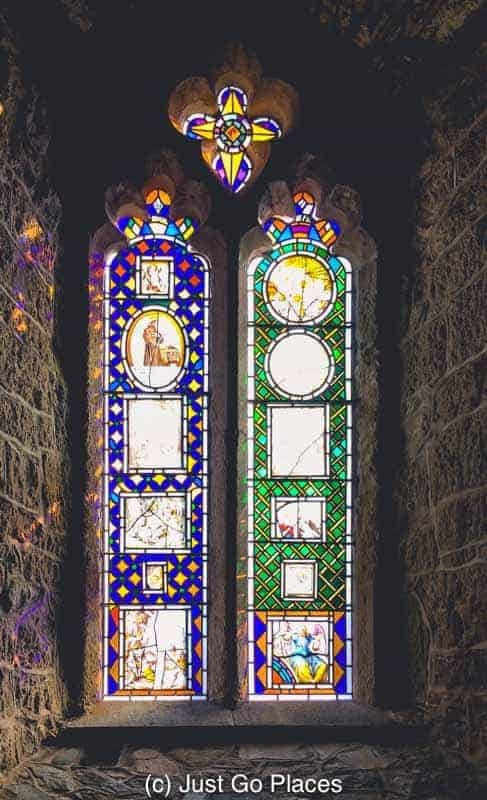 Beautiful stained glass windows in the chapel. The subtropical gardens are open when the gardens are in bloom. The subtropical gardens pretty much hang off the rocky surface of the Mount. We wanted to know how anyone could possibly carry food and basic necessities up to the castle. It would be the perfect place for Amazon to drone drop their items. The National Trust guide told us there is a Victorian train that takes necessities up to the castle. You can see the train hidden behind the cafe near the base of the mount. It’s not so much a train as much as a wagon. On the other hand, it sure beats having to carry up luggage and groceries. 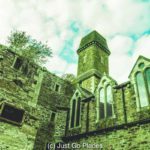 Despite having read about visiting St. Michael’s Mount, we found we were not prepared for the actual visit. I found that the things I worried about were actually really easy. St. Michael’s Mount has a dedicated parking lot right in the little town of Marazion across from the causeway where you can park your car. 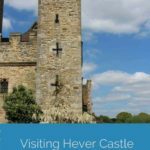 National Trust members receive discounted parking. The walk across the causeway is very easy and takes about 10-15 minutes. Don’t worry so much about the tides coming in. Every National Trust member seemed to know the times of the tides for the day. There are placards placed around the site reminding you of the tides. 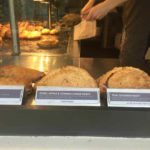 There are places to eat and shop on St. Michael’s Mount. After our trek up the hillside, we treated ourselves to some delicious ice-cream. The Courtyard Shop has a well-curated collection of items I hadn’t seen elsewhere. Make sure you wear comfortable walking shoes. Some of the stones underfoot really gouge into the soles of thin-soled shoes. Dogs are allowed only at the base of St. Michael’s Mount. The area is charmingly called the village and harbor. It is a more limited space than you would think because the walkway up to the castle is off-limits. I can not emphasise enough how much you should wear walking shoes. The path up to the Castle is NOT paved. My kids thought it was fun hopping from stone to stone. A well-dressed older gentlemen in front of us though went tumbling because his shoes did not have enough grip on the stones. We were lucky and went on a nice, dry day. I would imagine these stones would be trickier in wetter weather. The path up to the castle is pretty vertical. There are not even any front steps for this castle. You clamber up rocks to access it. The castle looms over the mount. Obviously St. Michael’s Mount is not wheelchair or buggy friendly from what I have said. Even toddlers may find it challenging though. I know from my own kids that they when they were toddlers they just wanted to explore by themselves. You’ll need to keep a close eye on them because the stone pathways are not smooth. Even inside the castle, there’s lots of stairs which could present a problem. Right near the car park, there is a charming little playground for children to let off some steam. Marazion is a charming little town in its own right. 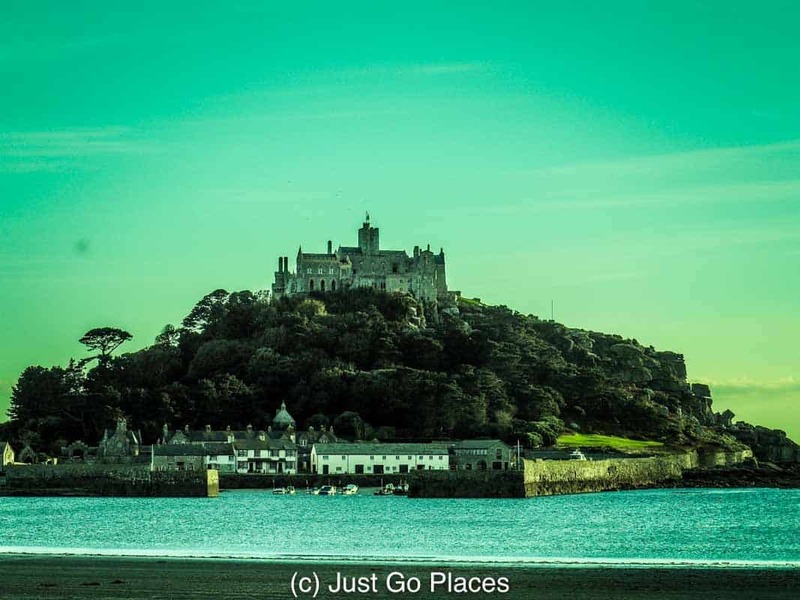 It’s got restaurants, cafes and benches that overlook St Michael’s Mount. With the sun glistening of the water and the rocks, it’s a view that you really can’t get tired of. 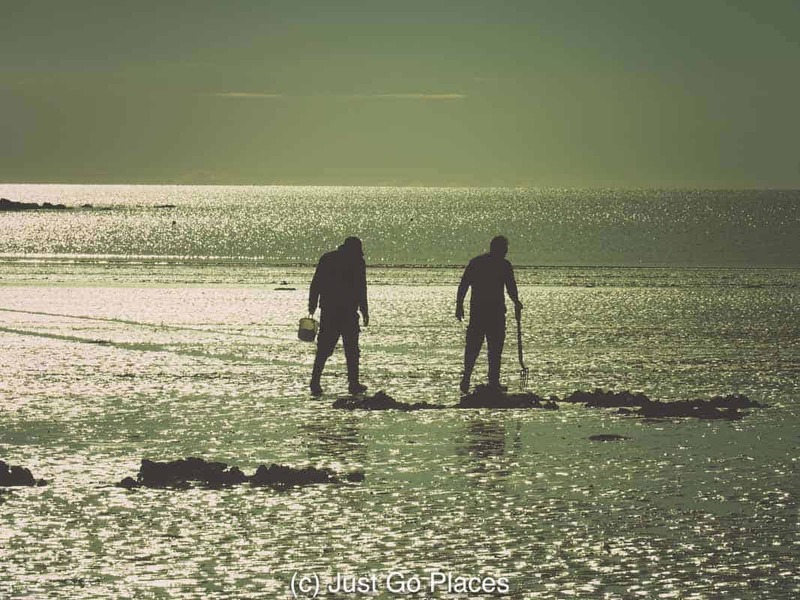 These men were out crabbing when the tide was out. Like other places we found in Cornwall, St. Michael’s Mount is closed on a Saturday. We thought St. Michael’s Mount was beautiful and lived up to expectations. When the tide is out, the beach is flat and great for children to play. When the tide is in, you can really see the beauty of the little isolated island castle. 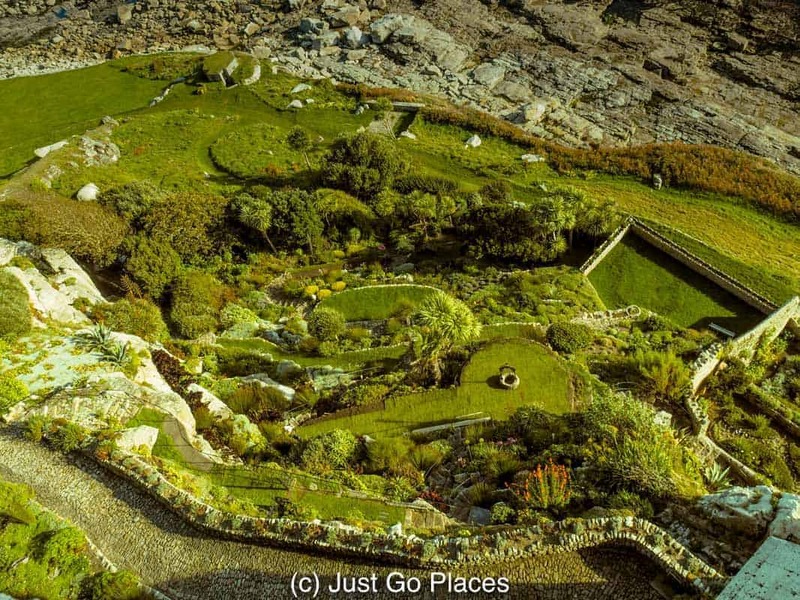 St. Michael’s Mount looks like an enchanting place to get lost for an afternoon. My kids would have loved it a few years ago, when they were passionate about Medieval history. I love the amazing seascapes in Cornwall, and I think this would be really fun! My kids haven’t gotten into medieval history yet … their school seems obsessed with modern history and all the world wars. I’m doing some of these castles to show them that history existed more than just the last 100 years or so. This is so cool! I love that the family still lives in the castle. Oh, England. 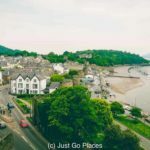 Great tips and advice for visiting. Cornwall is at the top of our UK bucket list, so we’ll be visiting here for sure. yes, right? 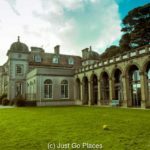 I cross-examined the National Trust guide because really I couldn’t believe people still lived there. 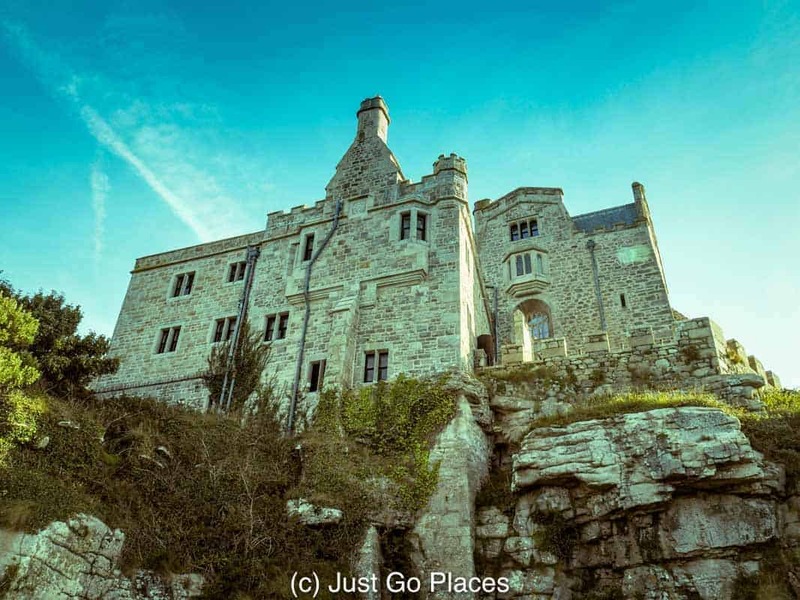 Cornwall is beautiful, outdoorsy and very kid-friendly. You’d love it. As a self-diagnosed history buff, this kind of thing is right up my alley. 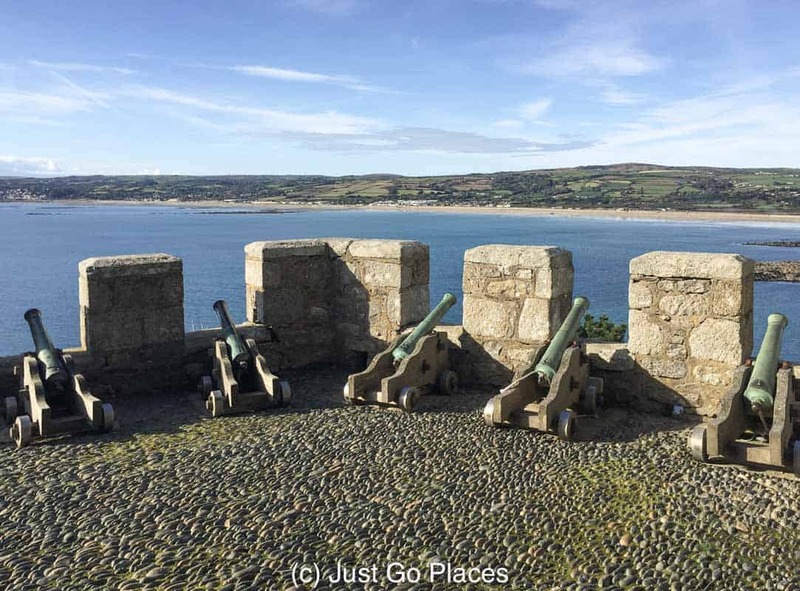 It’s incredible to think of all the history-defining events that took place here and with the castle jutting out into the sea, it really is a wonderful setting. Great to see you are advising visitors to pack comfy shoes though, don’t know how many times me girlfriend and I have visited places only for the trip to be cut short because of her poor choice in clothing! LOL. technically, I was wearing flats but didn’t have great grip on my shoes because no one told us it was completely rocky all the way. I did slip but didn’t fall unlike other people I saw. I wasn’t allowed to touch the books! I imagine they are — once something comes onto the island and up to the castle, it would be a lot of hassle taking it back. 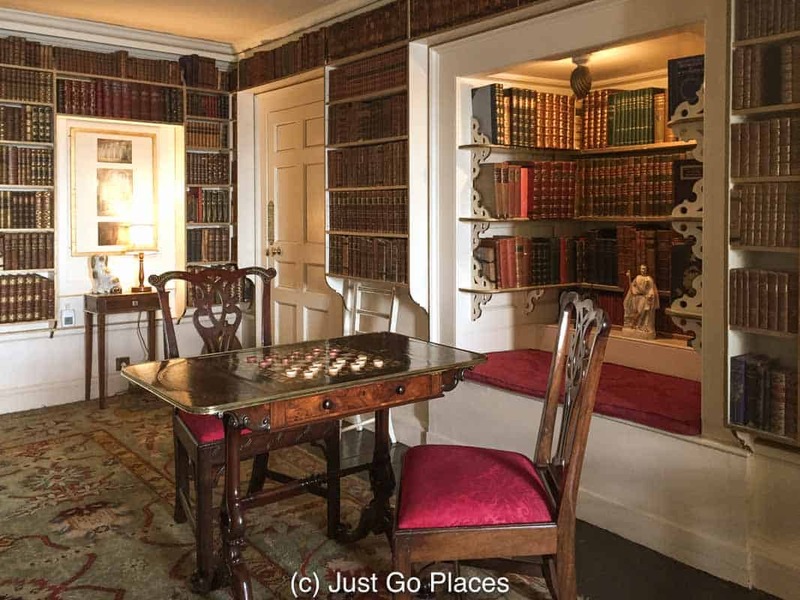 Through the years, you can imagine all the books the family would have accumulated. It was! I don’t know who those little cannons would protect against but they were sweet. yes, that tide info is key!! the day we went they didn’t have a boat coming back and you wouldn’t want to be stuck on the island. Probably the National Trust would have to bring you back (they are such nice people) but I’m sure they don’t want to which is why they kept making sure everyone knew the tide times. 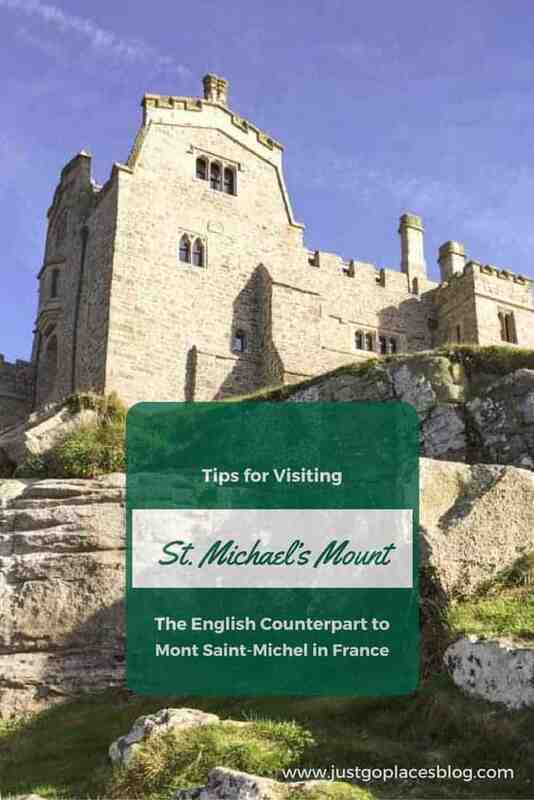 Yes, Mount St Michael was owned by Mont Saint-Michel in historic times. I really want to visit the main one (Mont Saint-Michel) now. What? I had no idea Mont St. Michel had a twin in Cornwall. I’ve got to go. I’ll remember your tips about wearing good hiking shoes! It hails back to when the Normans conquered England and ran both kingdoms. From what I could tell, Mont St Michel has proper steps leading up the mountain and is more geared towards visitors of all abilities. From the little thumbnail in the LinkUp, I really did think that it was Mont Saint-Michel in Normandy. My own kids would like exploring this place, but I cannot imagine trying to raise a family in a National Trust building. I suppose it’s a good thing that there’s not a visitor tram to get people to the top. It would detract from the atmosphere, although I’d probably start wishing for one partway up the walk. The walk up and down is fun especially since visitors are only doing it once. I can’t imagine being the family living there and ding it regularly.